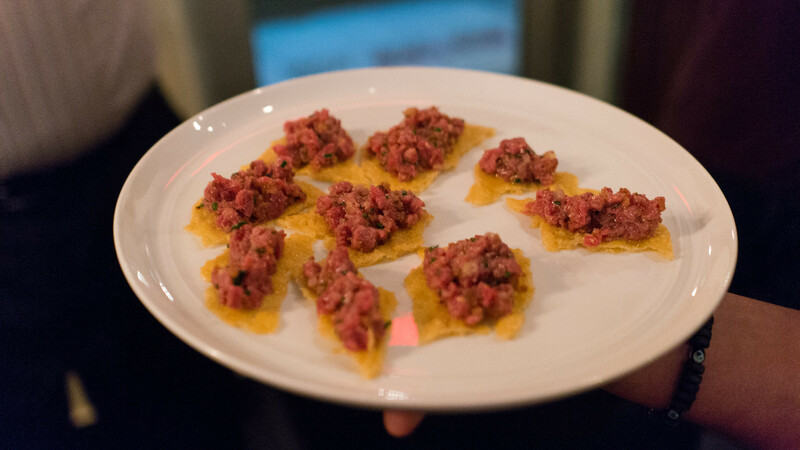 As our guinea pigs arrived, they were greeted with glasses of prosecco and some nice passed hors d'oeuvres: steak tartare given an umami boost with colatura (the ancient Italian version of fish sauce) served on parmesan frico crackers, and a nice light clam ceviche. 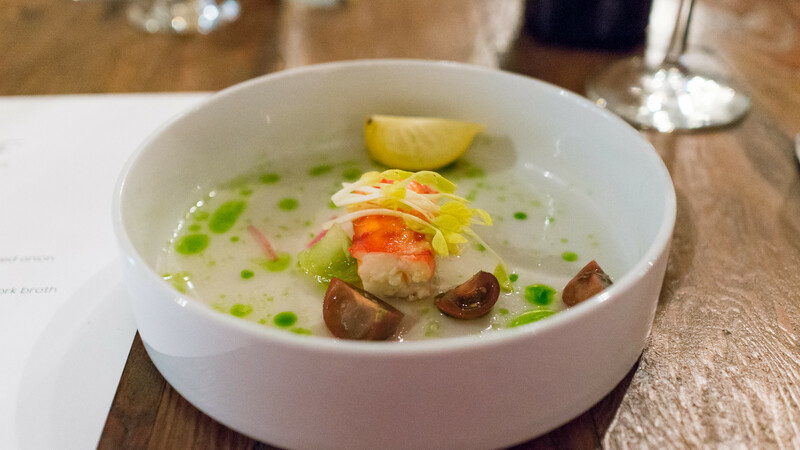 More light, clean flavors followed as our group of twenty-five was seated at a few communal tables: a tranche of sweet, meaty king crab served with local heirloom tomatoes in a sort of dashi broth flecked with tarragon oil. The next course was, for me, unexpectedly one of the best dishes of the night, and one of the most flavorful I've had in recent memory. A couple varieties of cauliflower florets were nestled over a creamy purée and draped with a slice of silky, salty, nutty jamón ibérico de bellota, given a jolt of heat from harissa and an enveloping richness from a dollop of roasted pork broth. 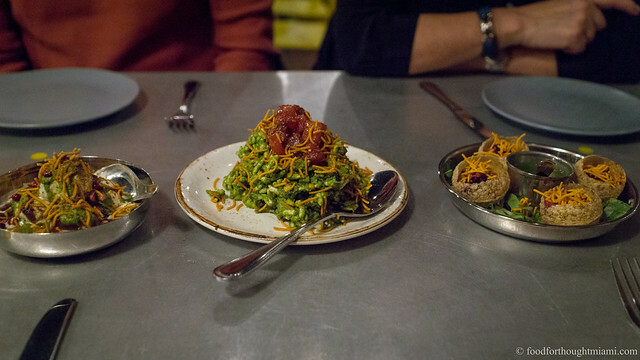 I'm a firm believer that vegetable-centric dishes need not be austere (or vegetarian for that matter), and this was a great example. Justin told me they'd just bought a pasta extruder and I suspect this was one of the first uses to which it was put: bucatini, a long round noodle that is hollow in the center. 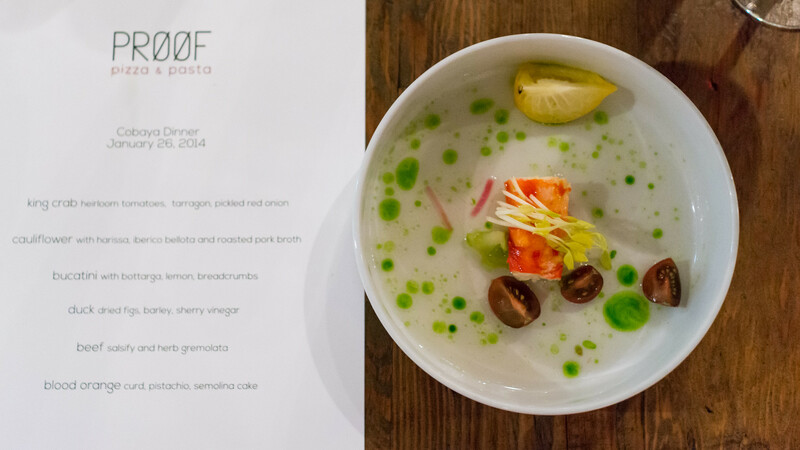 I've had great pasta at Proof and this followed suit. 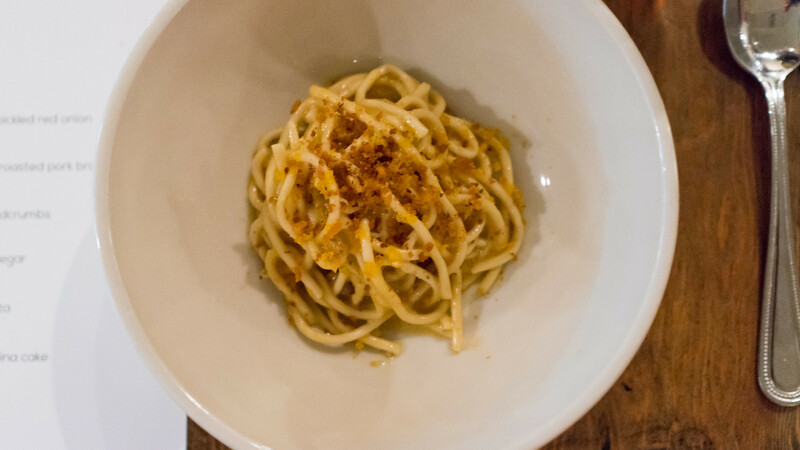 The chewy noodles were served with shaved bottarga and lemon breadcrumbs, balancing marine funk and citrus tang. 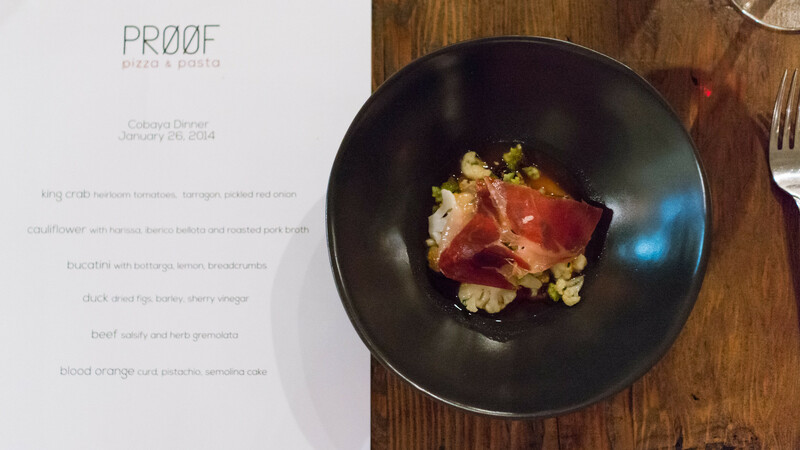 The menu at Proof sometimes includes a really nice salad that pairs farro with duck prosciutto. That combination of grain and game was served in another variation at our dinner. 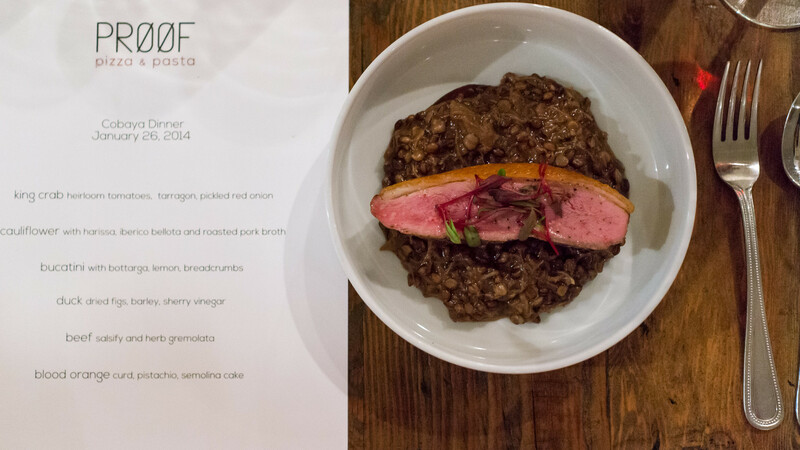 A really expertly cooked tranche of duck breast – rosy flesh capped with crispy, golden-brown skin – was plated over a bed of hearty, chewy barley tugged in sweet and sour directions by dried figs and sherry vinegar. 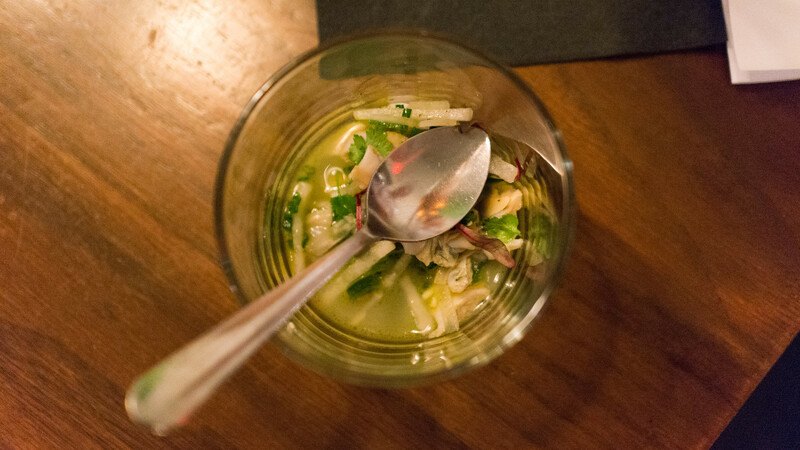 This was another great dish: no kitchen wizardry or plating pyrotechnics, just really good flavors. 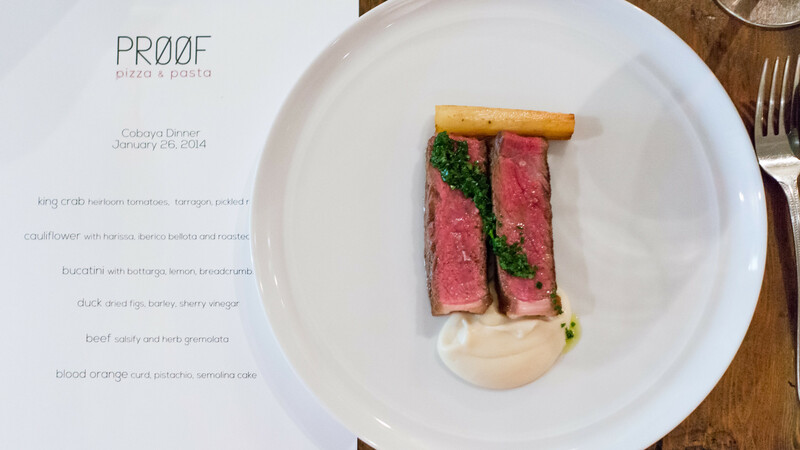 When we did a Cobaya dinner at Bourbon Steak, we didn't exactly discourage executive chef Gabe Fenton from serving steak – but in an effort to ensure he didn't feel constrained, we told him that he shouldn't feel obligated to. And so we may have had the first dinner at Bourbon Steak that didn't feature any steak. Maybe Justin was making up for that with this course, for which he brought in some Pat LaFrieda 50-day dry aged steaks. 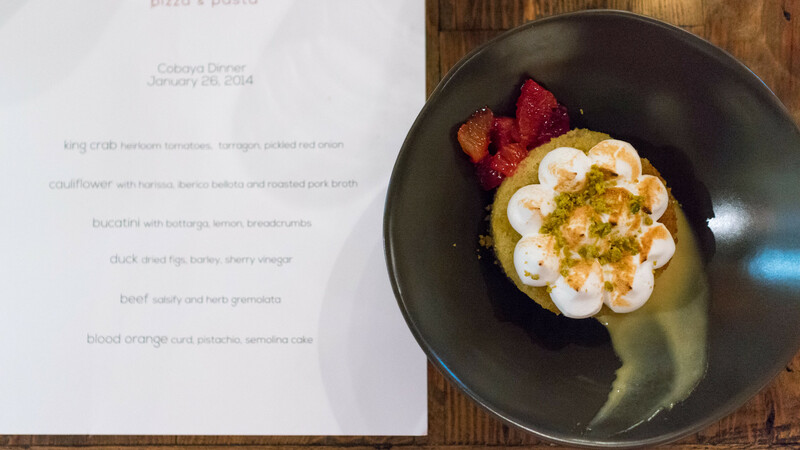 Super simple – just a couple broad sanguine slices slashed with a bit of herb gremolata, with a baton of roasted salsify and puddle of it in a creamy purée – and stunningly good. Proof is stockpiling another hidden talent in the pastry kitchen: Malcolm Prude, who turned out a meringue-topped semolina cake paired with blood orange curd and a dusting of pistachios, followed by a sampling of chocolates including a small version of his excellent macaron ice cream sandwiches. I was inclined to say his macarons are so good he ought to go into business with them, and it turns out he already has: he also runs Xavier's Macarons. 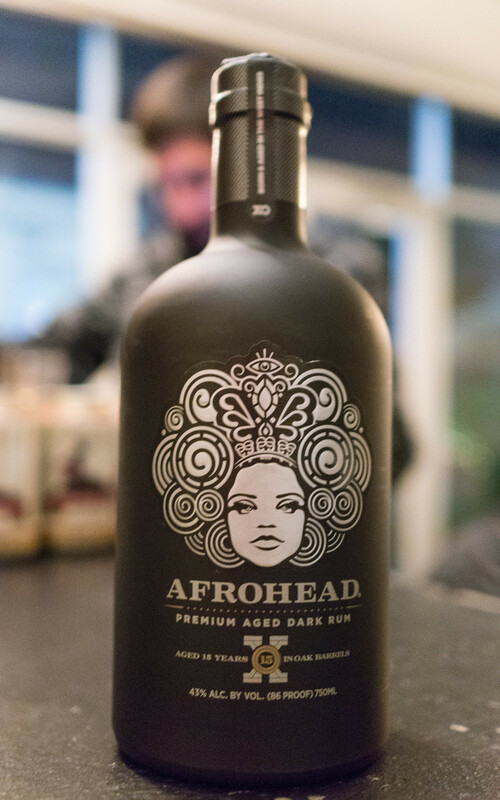 Post-dinner, we got a little extra treat from the folks who distribute Afro Head Rum, an aged Bahamian rum that showed well both in a cocktail (which they called a "Redhead," a spin on a Dark 'n' Stormy with ginger beer, lime juice, chile syrup and a candied jalapeño) and on its own. The food was excellent, but Justin, Matt and crew got everything else right too: a gracious welcome with prosecco and nibbles, a tight pace in moving through courses, friendly, relaxed servers, nice wine pairings, even a little take-home bag with a snack for the next morning. 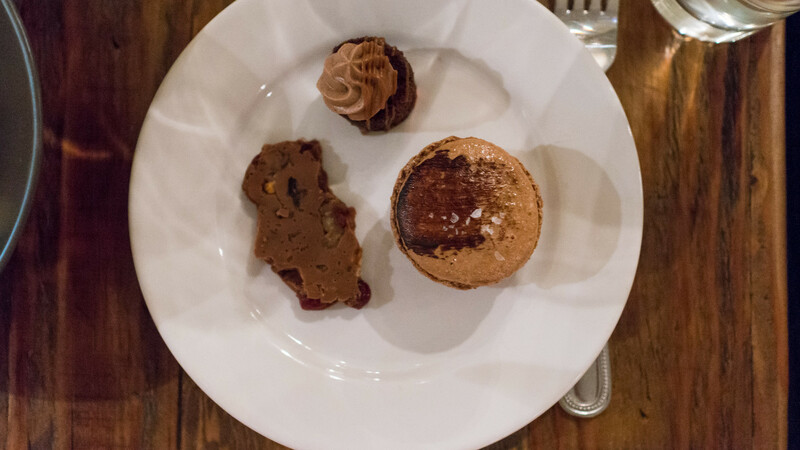 It's always a good sign when folks linger after the last course, and many were still hanging around long after the dessert plates were cleared. 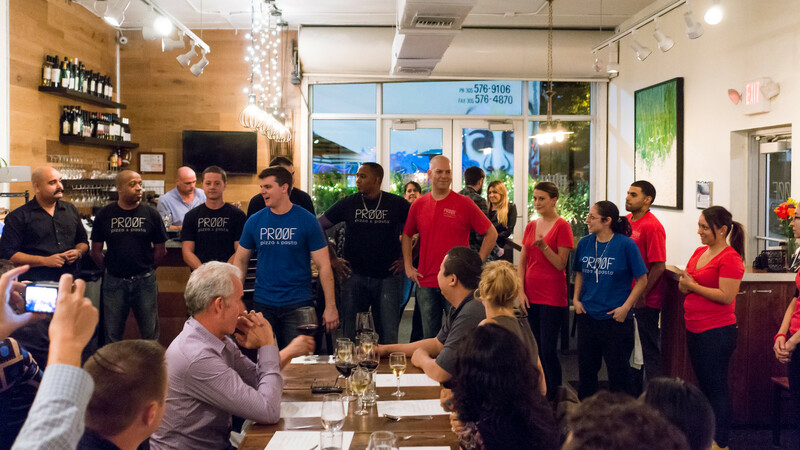 So a really big thank you to Matt, Justin, Malcolm, and all the rest of their team at Proof; and as always most of all, to the guinea pigs whose interest and support make these events possible. We were so happy Gabe was able to join us for this dinner.